N°1 Antioxidant Max by Lab One is a dietary supplement containing a complex of antioxidants that protect cells from the harmful activity of free radicals. The product contains a grape skin extract, including resveratrol in the amount of 200 mg per portion, dried microalgae Haematococcus pluvialis, including astaxanthin in the amount of 180 mg per portion, and vitamin C in the amount of 240 mg per portion. The product supports the antioxidant substances that occur naturally in the organism, and its task is protecting cells from the harmful activity of reactive oxygen species (ROS) as well as eliminating excessive oxidative stress, which contributes to the development of many medical conditions. Grape skin extract – contains large amounts of the active substance called resveratrol, which has a powerful antioxidant effect. It protects cells from the harmful activity of free radicals, that way reducing excessive oxidative stress in the organism, which can contribute to DNA damage or increased susceptibility to cardiovascular system diseases. It has been demonstrated that it increases the levels of SOD (superoxide dismutase) in cells, a naturally-occurring antioxidant in the organism responsible for preventing the negative activity of ROS. It inhibits platelet aggregation, which means that it prevents the formation of dangerous clots. It regulates lipid management by reducing the concentration of the LDL cholesterol fraction and triglycerides, that way preventing the development of atherosclerosis. It exerts a positive effect on neurodegenerative diseases by preventing the deposition of the protein beta-amyloid, which leads to brain function disorders and neurodegeneration, which, in turn, leads to Parkinson’s and Alzheimer’s diseases. The use of resveratrol by ill people significantly reduces the symptoms of the diseases and enhances cognitive functions and intellectual processes. Resveratrol also regulates blood sugar management by restoring normal insulin sensitivity in cells. It reduces the concentration of glycated haemoglobin (HbA1c), which shows average three-month blood sugar levels. That way, it helps to burn adipose tissue and reduces adipocyte concentration in the organism. Thanks to that, it is particularly recommended for the treatment of diabetes, insulin resistance, and other metabolic diseases. Vitamin C – called ascorbic acid, an organic chemical compound of the group of unsaturated polyhydroxy alcohols. It is a powerful antioxidant regulating the balance between antioxidants and reactive oxygen species (ROS). Moreover, it participates in collagen synthesis, which is important in terms of joint and tendon regeneration, strengthens immune system function, and participates in the production of neurotransmitters. It helps to maintain a healthy cardiovascular system by strengthening blood vessels and regulating cholesterol and triglyceride levels, whose high levels lead to such conditions as atherosclerosis. Vitamin C reinforces iron bioavailability, which is why it is particularly recommended for people with anaemia. Dried microalgae Haematococcus pluvialis – rich in astaxanthin, a fat-soluble organic chemical compound of the group of xanthophylls. It is one of the most powerful antioxidants out there – it has been demonstrated to be 65 times stronger than vitamin C, 54 times more powerful than beta-carotene, and 14 times more active than vitamin E.
It enhances the functioning of the immune system by strengthening natural defence mechanisms in the organism. That is possible because it participates in the production of lymphocytes and natural killer cells (NK), which constitute the first line of defence against pathogens. It has a beneficial effect on the health of the cardiovascular system, as it regulates heart function, protects blood vessels, prevents the development of atherosclerosis. It also has a positive effect on the eyes, as it prevents the development of macular degeneration (AMD) and retinal damage and enhances its regeneration. It has been demonstrated that astaxanthin is deposited in the skin, which it nourishes and rejuvenates from inside. It helps to achieve its healthy and radiant appearance. It takes care of the right skin firmness and elasticity and prevents discolourations, wrinkles, and cellulite. It prevents the harmful activity of UV rays, which contribute to the development of cancer cells the most. Astaxanthin is recommended for people who suffer from diabetes and other ailments characterised by the metabolic syndrome (a combination of all the symptoms that contribute to the development of atherosclerosis, hypertension, and other vascular problems). It has been proven that astaxanthin reduces the concentration of glucose and insulin in blood, restores the ability of tissues to assimilate insulin, and reduces extensive inflammation. It also slows down the development of diseases typical of people with diabetes, that is diabetic nephropathy, cataract, or diabetic retinopathy. Substances with antioxidant properties are very important for maintaining the organism’s full health. That is because they reduce oxidative stress, that is the state of imbalance between reactive oxygen species and the amount of antioxidants. Excess free radicals in the organism contribute to the increased morbidity of cancer, cardiovascular system diseases, and neurodegenerative diseases, such as Parkinson’s disease. Free radicals induce damage on a cellular level and in DNA synthesis, which can lead to cell mutations. Eliminating the harmful activity of excess free radicals is possible thanks to naturally-occurring substances with antioxidant properties, that is glutathione, superoxide dismutase (SOD), or glutathione peroxidase. As a result of taking pharmaceuticals, ailments connected with autoimmune diseases, consuming large amounts of processed food, and general environment pollution, natural antioxidants might not be able to deal with excess free radicals, which is why it is so important to provide reinforcements from outside. The product contains carefully selected substances characterised by synergic activity that fantastically support the fight against oxidative stress. 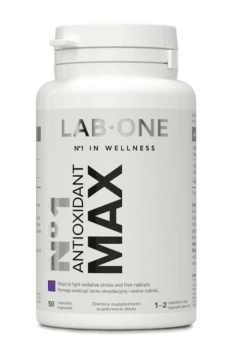 To sum up, N°1 Antioxidant Max by Lab One is a dietary supplement containing a wealth of the most powerful natural substances with antioxidant properties. They reduce oxidative stress induced by excess free radicals, that way preventing many diseases and delaying aging processes in the organism. No1 Antioxidant Max 50 caps. 1- 2 capsules daily in the morning, swallow with water. The ingredients of the supplement come from natural sources, so they can be used as continuous supplementation. They reach their highest bioavailability when taken with the main meals. Glazing agent: hydroxypropyl methyl cellulose, anti-caking agents: magnesium salts of fatty acids, silicon dioxide; gelling agents: carrageenan, potassium acetate. Supplement containing 100 mg of coenzyme Q10 with PQQ and absorption-increasing BioPerine.